Every time when prosecutors are asked about the investigation of the billion dollar theft they invoke three criminal cases, and namely, "Shor case", "Filat case" and "Platon case” that have had different "fates" since the start of the prosecution. Several violations of the proceedings, excesses on the side of prosecutors and judges, ill-treatment, and human rights violations in custody and detention were reported in two of these cases. Reference to Shor, the first person concerned in a criminal case on the theft from Banca de Economii, Banca Sociala and Unibank, the case has "frozen" on the table of the first court level’s judges. What served as the ground for initiating criminal prosecution? If in the case of Ilan Shor the prosecutors handled two criminal cases in which he was charged in the spring of 2015 and the summer of 2016 starting with the investigation of what happened at Banca de Economii, Banca Sociala and Unibank, then the grounds for criminal cases concerning Vlad Filat and Veaceslav Platon were two confessions of the main actor of two reports prepared by Kroll. At least in the case of Filat, several of the statements in the confession proved to be false. The sum of the bribe that Shor said he gave to Filat was also not confirmed. Vlad Filat was retained by prosecutors on 15 October 2015, just two days after Ilan Shor had made the confession by which he accused the former Prime Minister that, over several years, he had extorted bribes worth 250 million dollars from him. According to Shor, the money was also paid out of bad loans taken at BEM with the view to ensure the protection of the businessman's business. Shor was heard by the Anti-corruption Prosecutor Adrian Popenco in his own office at the Trade Unions Headquarters’ building. Corneliu Gurin, at that time the Prosecutor General, came to the Parliament on 15 October 2015 to request waiving the immunity and prosecution of Vlad Filat, handed to the Members of the Parliament a document with the charges brought against the politician, demanding discretion from the MPs. However, Andrian Candu, Speaker of the Parliament, read the prosecutor's request at the plenary session, and the following day the document became known to the mass media. The defence counsels of the politician claim that the immunity waiving and detention of their client was done with violations. Filat did not have the right to defend himself during the debates in the specialized committee and the retention took place before the decision on immunity waiving was published in the Official Gazette. In the case of Veaceslav Platon, Ilan Shor made the confession on 22 July 2016, when he was retained by law enforcement bodies. Shor tells in the document how in the autumn of 2014 Platon would have asked him to help pay back a loan at Victoriabank. Being the chairman of the Board of Directors at BEM, Shor decided to give to Platon several loans from BEM worth EUR 33 million. Subsequently, the money would have been transferred to the accounts of several companies, attributed by the Kroll report to Shor, and then it would have gone off-shore. Three days after the confession the judges issued an arrest warrant for Veaceslav Platon. On the same day, Platon was retained in Kiev by the Ukrainian authorities. The former Prime Minister was escorted to the National Anticorruption Centre (NAC) on 15 October 2015, from where, two days later, when judges issued the first arrest warrant for him, he was transferred to Penitentiary 13, where he is staying in present. Filat was in pre-trial arrest for one year and 28 days, until the final conviction. Neither Veaceslav Platon has ever been free from restraint since 25 July 2016, when he was detained by the law enforcement bodies from Kiev and extradited to Chisinau. Like Vlad Filat, Platon was held in custody in Penitentiary 13. 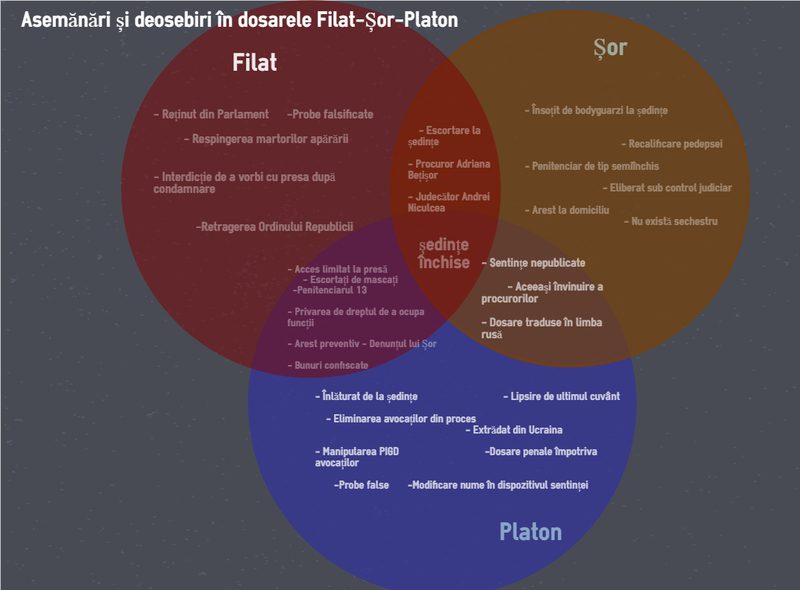 Another curious aspect concerns the conditions under which Platon was extradited to the Republic of Moldova. The Centre for Investigative Journalism has previously reported that the businessman was brought from Kiev by a charter flight. Within the period of almost three years after his first criminal case was initiated Ilan Shor was in a place of pre-trial detention for 42 days (24 June - 5 August 2016). Unlike Filat and Platon, Shor was “accommodated" at the NAC detention centre where the conditions of detention are significantly better than those in Penitentiary 13. Shor has also been under house arrest for 11 months, but since 21 June 2017, he is under supervised probation, according to the conviction sentence. Thus, the only restriction applied to him is not to travel abroad without prior notification of the court. He enjoyed this right as well by making a visit to Strasbourg in October 2017, where he met and shook hands with several European officials. 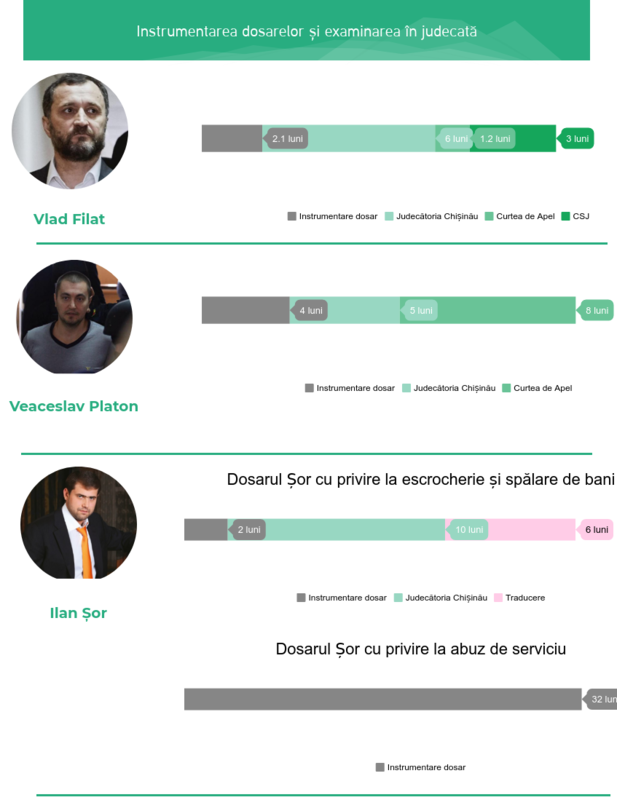 The four criminal cases referring to Ilan Shor (two cases), Vlad Filat and Veaceslav Platon had different fates since the moment the criminal prosecution has started and until now. In the case of Vlad Filat, two months and ten days have passed from the confession of Ilan Shor and until the submission of the case to the court trial. The examination of the case in the court of first level court by Judge Andrei Niculcea lasted for half a year, during which 45 hearings were held. For some of them, Filat was forced to attend despite the fact that he invoked health problems. At one of the court hearings Filat lost consciousness and medical assistance was required. The examination of the case in the court of appeal lasted for a month and 20 days, during which 11 hearings were held. The sentence was delivered in a rush on 11 November 2016, two days before the second tour of the presidential election, and in the next three months, the Supreme Court of Justice also ruled on Filat case. Overall, the Filat case was examined in the court for eight months. It took prosecutors four months to initiate and complete criminal prosecution against Veaceslav Platon and to submit the case to the court. The businessman's case was submitted to the court on 18 November 2016, and five months later, on 20 April 2017, the first court level already published the sentence. In another eight months, on 18 December 2017, the Court of Appeal also ruled its judgement. The case should also be examined by the SCJ. In the case of Shor, even if the prosecution of the case in which he was accused of fraud and money laundering lasted only two months, the case has stuck in the court. The examination of the case at Chisinau district Court (by the same judge, Andrei Niculcea) lasted ten months, during which 33 court hearings were held. The reasoned sentence of Shor conviction was drafted in July 2017. However, the case has not been yet submitted to the Court of Appeal, even if both businessman's defence counsels and prosecutors appealed the judgement of the first court level. Judge Andrei Niculcea states that the submission of the case is being delayed for six months due to the translation of the sentence into Russian. And in the case of Veaceslav Platon, the conviction sentence was translated into Russian, but the procedure took a month and a half. The first case of May 2015, in which Ilan Shor was accused of abuse of office with serious consequences, as chairman of the BA of BEM, continues to be at the stage of criminal prosecution. "There are many cases in the proceedings, it's a complicated case. There are several reasons. We take all the necessary measures to progress with the prosecution”, told us the Head of the Anti-corruption Prosecutor's Office, Viorel Morari. All three trials were held behind closed doors at the request of prosecutors. In the case of Filat, initially, the prosecuting officers justified their request by the fact that the prosecution in certain parts of charges continued, when the case was already on the magistrates' table at Chisinau district Court. At the same time, prosecutors have repeatedly stated that hearings behind closed doors would have been necessary, including to protect the good conduct of the investigation concerning the fraud at Banca de Economii and not to jeopardize other pending cases. The case continued to be examined behind closed doors by the judges of Chisinau Court of Appeal. The same explanations have been invoked by the prosecuting officers in the cases that concerned Platon and Shor. "Pursuant to Article 316 paragraph 4, the Chairperson of the court hearing may limit public access to the hearing, taking into account the conditions under which the case is examined. Therefore, the access of public and press is forbidden", dictated on 23 November 2016 Victor Boico, the chairperson of the panel of judges who convicted Platon in the first court level. The decisions of judges to examine those three high profile cases behind closed doors, have raised much criticism from the civil society. Since the examination of the merits of the cases and until delivering judgements on each of them, several non-governmental organizations through regular public appeals have requested to make the hearings public. The same was requested by the defendants of Vlad Filat and those of Veaceslav Platon, but the requests were rejected by the courts every time. "It is inadmissible for the high profile cases to be examined behind closed doors. Courts have to learn the lesson and understand that these cases require maximum transparency. Otherwise, the court is discredited. The prosecutors are only a party in the proceedings, and judges need to take a balanced decision when they express their opinion whether the court hearings to be held behind closed doors or not." "It is good that the hearings are not public when the conditions set out in paragraph 2 of Article 18 of the Criminal Procedure Code are met, if the examination of the case behind closed doors follows the interest to ensure the protection of morality, public order or national security; when the interests of juveniles or the protection of the private lives of the parties in the proceeding so require or to the extent the court considers this measure strictly necessary due to special circumstances when publicity could damage the interests of justice." "When there are prerequisites for the examination of certain cases behind closed doors, the prosecutors requests, and by the reasoned ruling, the court rules on the limitation of the access of the press or public for the entire duration of the proceeding or for a part thereof. When the interest of justice is concerned, this procedure must be applied regardless of the pressure of the society. The purpose of justice is not to satisfy the curiosity of the public, but to find out the truth and to hold all guilty persons accountable." Both Vlad Filat and Ilan Shor were escorted to the court hearings during the entire period of proceedings, as opposed to Veaceslav Platon, who, shortly after the examination of the case started, was removed from the hearings. According to a ruling as of February 2017, he was removed from the trial for "simulating the impossibility of attending the court hearing considered by the court as a method of delaying the examination of the case”. Furthermore, Platon was also deprived of the last plea before pronouncement of the sentence at Buiucani District Court from Chisinau. At the Court of Appeal hearing, Platon’s defence counsel and the defendant himself, were removed from several hearings. At the last hearing at the Court of Appeal, two of the businessman's defence counsels were expelled from the room, being completely removed from the trial before. Only one of the counsels defended the convicted. As the defence counsels say, Platon, although he was present, was not allowed to fully support his plea, and he did not have the right to the last plea. If there were dozens of masked men forming walls in the court corridors around Filat and Platon, Shor enjoyed a calmer atmosphere, being accompanied by his bodyguards all the time. Both, businessman Platon and former Prime Minister Filat, had limited access to the media. Before and after the court hearings, the law enforcement authorities did not allow them to talk to the press representatives. Most of the statements were launched, by both of them, on the corridors while they were escorted by the masked. Earlier, prosecutors have also seemed annoyed by some of the messages placed on the official Facebook page of the former Prime Minister. Even after the final conviction, Filat has no right to communicate with the press. The Department of Penitentiary Institutions refused several requests of journalists to interview the former Prime Minister. The mayor of Orhei, on the other hand, even organized a press briefing on 25 March 2016, where he insisted that he was not guilty of the thefts at Banca de Economii. Another briefing on the subject was held by Shor a year earlier on 19 March 2015, almost two months before being detained in the first case. He then accused several politicians of starting a campaign of his denigration. However, at one of the hearings at Buiucani District Court from Chisinau, the bodyguards of Shor blocked the entry into the judge's office and the access of journalists to the businessman. Being at liberty, but under supervised probation, until the final sentence is issued, Ilan Shor was prohibited to leave the country. 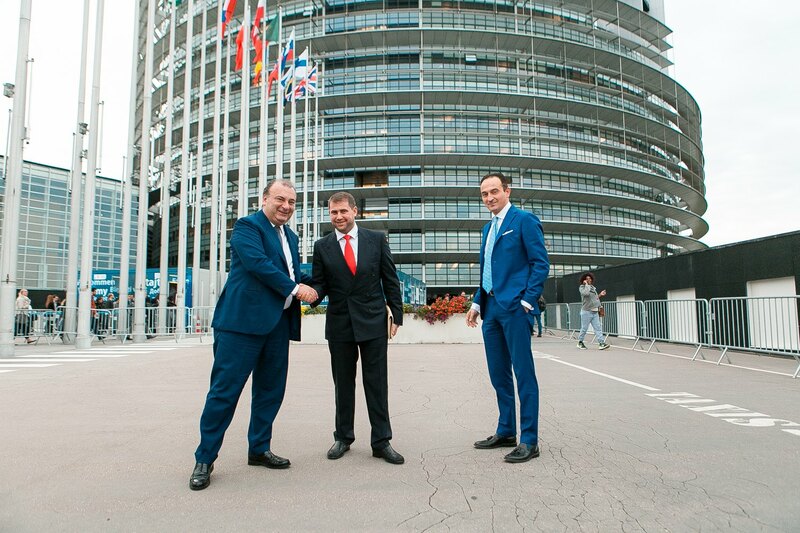 However, at the beginning of October 2017, the businessman managed to come to the office of the European Parliament in Strasbourg, where he met with over 20 MEPs, including two vice-presidents of the Legislative Forum. In a press release of the Shor Party it is stated that the mayor of Orhei had talked with the Members of the European Parliament, among other things, about the case of the "billion theft", the discussions being "auspicious and useful”. The visit was approved by the first court level. Earlier, magistrates did not allow a similar trip to Brussels. On the other hand, the suspended mayor Dorin Chirtoaca, investigated for influence peddling, was not allowed to go to Strasbourg to attend the Congress of Local and Regional Authorities of the Council of Europe, notwithstanding the fact that he is the vice-president of the entity. Indeed, during the last year, the representatives of the Shor Party and defence counsels that defend the businessman made several official visits to Strasbourg and Brussels. The communiqués of the party are abundant in promises to support the mayor of Orhei given by several MPs, members of the European People's Party (EPP). "You can count on our support, together we will win in the case of Ilan Shor", declared MEP Fulvio Martusciello. Another colleague of his, Alberto Cirio, visited Orhei on 21 December. Ilan Shor boasted about the projects implemented in the city. "The locals have great luck with such a mayor, whose work is visible, being the man of deeds and not of words", the European deputy would comment, according to the source. Earlier, Joseph Daul, leader of the EPP, specified for Radio Europa Libera that there was no official contact or official meeting between Ilan Shor and the leadership of the party he represents. "We do not share the same values with the Shor left and populist party. After Moldovan justice found him guilty of money laundering and bank fraud, Ilan Shor must serve his punishment because he had stolen from Moldovan people", Daul commented. If the conviction judgement of the first court level concerning Vlad Filat was published in full, with the anonymization of the data, then the reasoned judgements concerning the other two never were made public. Initially, the judges who examined the case of Filat on the merits ruled that the reasoned judgement should be kept secret until the Chisinau Court of Appeal ruling. However, two weeks after the pronouncement of the sentence 24 pages of the document were published on the website of Buiucani District Court from Chisinau. Subsequently, full depersonalised judgement was made public, being anonymized the name of the convicted, prosecutor, defence counsels and interpreter. The full texts of the judgements issued by the first court level concerning the other two convicted, Ilan Shor and Veaceslav Platon, have never been made public. Only the disposals of both sentences are available on the courts’ portal. And in this case, the names of the parties, interpreters and that of the defendant are anonymous. The document that concerned Shor was published in two days after the pronouncement, while in the case of Platon - only two months later. As far as the court of appeal is concerned, almost a year and two months after its publication, the conviction judgement issued by the Court of Appeal for Filat has not been made public. Instead, the one from the Supreme Court of Justice is available, also anonymized. Neither the reasoned judgement of the Court of Appeal in case of Platon, taken on 18 December 2017, is available for the time being. Ilan Shor and Veaceslav Platon were accused by prosecutors of committing the same acts - fraud on an especially large scale and money laundering on an especially large scale. For Shor, who would have laundered 5 billion lei at Banca de Economii, the prosecution demanded a term of imprisonment of 19 years, with the deprivation of the right to hold certain positions in the banking system for a period of five years. In the case of Platon, although the invoked sum is about six times smaller (800 million lei), the required punishment was somewhat greater - 23 years of imprisonment, with deprivation of the right to hold certain positions in the banking system for a period of five years. Platon was finally sentenced to 18 years of imprisonment in closed prison. The accusation of Ilan Sor, on the other hand, has undergone changes along the way. The court reclassified the "especially large scale fraud” (punishable by 8-15 years of imprisonment, under the Criminal Code) into "causing damage through deception or abuse of confidence on an especially large scale, if the deed is not an embezzlement" (for which the Criminal Code stipulates up to three years of imprisonment) and money laundering on an especially large scale. Finally, Shor was sentenced to seven and a half years of imprisonment in a semi-closed prison. Platon has been deprived of the right to hold positions in the banking system, but Shor not. At the same time, while the former remained in pre-trial arrest in Penitentiary no. 13, until the sentence becomes final, the latter was immediately released in the courtroom under supervised probation until the sentence becomes final. For Vlad Filat, prosecutors demanded 19 years of imprisonment with a fine of 60.000 lei, deprivation of the right to hold certain public positions for 5 years and withdrawal of the state distinction the Order of the Republic. All these were demanded passive corruption on an especially large scale and influence peddling with the receipt of goods or advantages on an especially large scale. The court sentenced him to nine years of imprisonment in a closed prison, following the other demands of the prosecution. The sentence was upheld until the Supreme Court of Justice, and Filat did not go at large. In addition to the received punishment, the magistrates of the first court level ruled on the seizure from Vlad Filat of four vehicles, which are the object of the illicit remuneration worth over 4.5 million lei, as well as several real estate objects and shares worth almost 800 million lei. 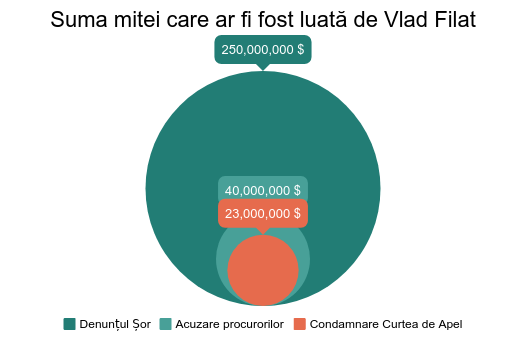 Chisinau Court of Appeal reduced the amount by almost half after the lawyers of the former Prime Minister proved in the court that the seizure of almost 321 million lei of the initial amount was unjustified, as it would have come from the false witnesses who were involved in the case. The error was also acknowledged by the magistrates of the SCJ. "The College accepts that the court of the first court level wrongly applied the security measure in the form of a special seizure of the goods constituting the equivalent of the unlawful remuneration amounting to 791,298,222 lei, namely by including in the total sum also the amount of 320,941,414 lei which was excluded from the accusation brought against Vladimir Filat on the grounds that the guilt had not been proved in this part of the charges”, according to the judgement of the Supreme Court. Thus, Filat would return to the state just about 472 million lei. Veaceslav Platon was also originally obliged to return 869 million lei from the sale of several buildings, shares and goods owned by him or his affiliated persons and which the court of the first court level ordered to seize. Subsequently, the Court of Appeal decided to withdraw the seizure of some of these assets worth more than 150 million lei. If, for those two, the civil actions were also solved within the criminal cases, Ilan Shor escaped this point easily also, at least for the time being. According to the judgement of the first court level, the civil action was admitted in principle, but the amount of the damages is to be subjected to the judgement of another trial in civil proceedings. "Civil action concerns the prosecutor's requests, stated verbally, to collect from Ilan Shor those about 5.4 billion lei, based on the claim of the administrators of those three banks: BEM, Social Bank and Unibank", says Viorel Morari, Head of the Anti-Corruption Prosecutor's Office. According to Chisinau district Court, at the moment there is no pending lawsuit before the court, which would concern Shor on the one hand, and Banca de Economii on the other hand. Instead, the National Bank claims that BEM has been recognized as a civil party in a criminal case for granting bad loans. "Taking into account that Ilan Shor held the position of the chairman of the BEM Council, at the bank request, the criminal prosecution bodies initiated a criminal case for collecting the damages incurred by the bank in connection with the granting of the loans to Dracard SRL, Provolirom SRL, Caritas Group SRL, Voximar-Com SRL. As regards the initiated criminal case, BEM has been recognized as a civil party as a result of caused material damage amounting to 5.2 billion lei. Recovery of pecuniary damage by civil action submitted within the framework of the criminal case examination depends on the final result of the examination of the criminal case in the court”, according to the NBM. As to the court costs, according to the judgements, it was ruled to receive from Platon 303.568 lei for the benefit of the Prosecutor General's Office and NAC, and Filat was imposed to pay 15.561 lei to the NAC account. On the other hand, Ilan Shor was not imposed to pay the court costs. Criminal investigations and trials in relation to the three defendants have been held with multiple deviations. The period of investigation of Filat case has been accompanied by several press conferences and leaks of information that appear to have taken place in the prosecutor's office, through which documents seized during the search appeared in the media. In court proceedings, according to Filat's defence counsels, the judges refused to hear several witnesses of the defence: Oleg Reidman, Mihail Gofman, Veaceslav Platon, Russian banker Pavel Neumivakin, and three young people from the Russian Federation who, according to prosecutors, would have been intermediaries for the transfer of 320 million lei from Ilan Shor to Vlad Filat. Later, an investigation by the Centre for Investigative Journalism revealed that those three young people and the Russian banker had no business with Vlad Filat or Ilan Shor. "In my capacity as of a defender, I have notified all possible institutions at the national level through hundreds of complaints in which I invoked the violation of the rights of Veaceslav Platon. I have received formal answers to all of them without an effective investigation of the facts and getting to the bottom of the complaints. Therefore, it has become a rule: in the case of Platon, everything that comes from the defence is rejected. Violations admitted at the trial of his case seem to reduce this process to a mere formality in which the accused has his sentence already written before being tried. We can state that they are trying to hide the circumstances of money theft from BEM, including the way in which the amount of money attributed to our client was embezzled. Similarly, they are trying to hide the real beneficiaries of this money." "No complaint has been sent to the ECtHR yet, but it would be possible in the future. Concerning the translation of the sentence, there is a system issue related to the court interpreters and translators, but this concerns more the Ministry of Justice. We have not notified the authorities about this yet." "There have been several complaints. Each time practically the same reasons were invoked, mostly some issues related to the trial proceedings, which per se do not constitute grounds for disciplinary offence. There was no disciplinary procedure because there were no grounds. There are reasoned and substantiated decisions by which the complaints of the defence counsels were rejected as ungrounded. " Both Vlad Filat and Veaceslav Platon complained to the European Court of Human Rights, invoking several violations that the state of the Republic of Moldova would have consistently admitted in the trials they are concerned. The former Prime Minister lodged his first application in December 2015. He referred in particular to the way in which he was detained and put under arrest, the waiving of parliamentary immunity in a public session, and not by secret ballot, the conditions of detention in Penitentiary no. 13 and the transfer from one cell to another without solid reasons. 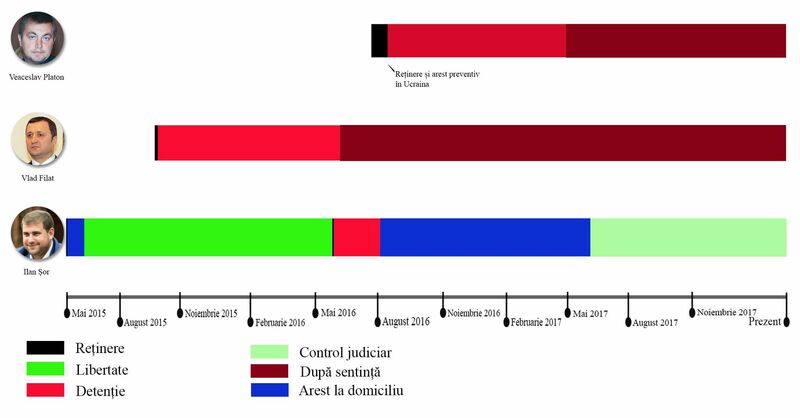 The second application was sent to the Court in Strasbourg in August 2017, in the context in which, according to the defence, the magistrates of the Republic of Moldova had issued an illegal judgement on conviction. According to the defence counsel, Igor Popa, none of the requests have been communicated to the Government yet. Veaceslav Platon submitted three applications to the ECtHR during 2017, in which he provided reasons concerning multiple violations. Among other things, the applicant invoked: lack of relevant and sufficient reasons justifying the application and prolongation of arrest, refusal to hear witnesses for the defence, prohibition of the applicant's participation in the trial concerning arrest, prohibition of access to the defence counsel, refusal to meet his defence counsels, prohibition of arrest trials in public meetings, detention in inhuman and degrading conditions, refusal of access to medical care, deprivation of food, refusal to meet with relatives, etc. This investigation is published within the framework of the project "Empowering Moldovan Civil Society to Demand Justice", implemented by the Legal Resources Centre from Moldova with the financial support of the US State Department through the International Bureau of Criminal Justice and Law Enforcement of the US Embassy in the Republic of Moldova. Victims of domestic violence, mostly women, often depend on a justice system that does not protect them and does not show leniency when out of despair they try to defend themselves or counter-attack, say lawyers and human rights activists. Angela Gojan. Photo: CIJM Angela Gojan was just over 20 years old when her marriage became a nightmare for her. Finally, 10 years later, she decided to break the vicious circle. The woman says that she was cruelly beaten for trifles: someone looked at her, or she did not take care of the child or did not exactly meet her husband's requirements.